I have known how to whistle ever since I was a child. I don’t remember when or how I learnt, but I have the vague impression that I worked at it. Both my parents whistle and even my sister knows how. There was a point when whistling a particular way was “the” way to call one of the dogs. The other two didn’t take to it so well. I still whistle quite a bit. Despite my best efforts to teach him, Amit never got it. He says his father can, and – what’s even more surprising – that his father tried to teach him when he was small, but he never got it. Mrini has been trying to teach herself to whistle, off and on. Mrini’s ability to teach herself things, and to work persistently at something till she gets it is quite remarkable, so I expected her to pick it up sooner or later. But the way things turn out it, Tara was the one to get it. She just got it one day, by chance, and having got it, she kept doing it until it was clear that she could whistle at will. Obviously, she was immensely proud of this new accomplishment. Strangely enough, she learnt to whistle in instead of whistling out. Whistling in is not, in my experience, so effective at producing a melody as whistling out is. I showed her how to whistle out but she still hasn’t got it. Mrini, significantly, has stopped trying. Tara is a sweet, considerate girl. She often does things just to tease Mrini, but, having teased Mrini sufficiently to draw the first indication of tears, she almost always relents and gives in – which usually involves handing over whatever prized possession she has managed to get hold of. So, pleased though she was to be whistling, she didn’t try to flaunt it in Mrini’s face too much. However, she was soon trying to whistle along with songs that we listen to in the car on our drive home. Mrini hasn’t said anything much, yet. And Tara? You know what she has to say about it? I even did a Google search, but it is as I feared. It broke my heart to tell her – we don’t actually seem to have whistling classes in Bangalore. But I like the way she thinks. As most of you know, we are building a house. Amit is in charge of the project, and I mainly exercise veto power – which I use sparingly (in my opinion). That explains why we’ve ended up with a mud brick construction and just narrowly avoided composting toilets that flush using sawdust instead of water. The deal is that he’s in charge of the plan and execution, I’m in charge of interiors. Of course, with pale pink mud brick making up in every square inch of every wall in every room, there’s not a lot one can do with the interiors, but I have plans (and I’m not saying a purple sofa won’t feature – anything to liven up the place). The one thing we’re both fighting over, however, is neither the building itself, nor the interiors – it’s the garden space. When I say “garden” I really mean the little strips of open space at the front, back and sides. We don’t have a farmhouse, after all, or even a mansion – just a small plot hemmed in on all sides by other small plots with big houses. So there’s not a lot left over for the “garden” – so inevitably, what there is, we’re fighting over. Amit, obviously, wants his precious vegetable garden. I’ve promised him the four-foot strip on the west side of the plot. In return, I get the front, the ten-foot driveway on the east, and the 6-foot back yard. Fair and square, don’t you think? Mud brick is a deadly boring thing, all earthy pale pink and drab as could be. One can’t paint over it, so what I plan to do is to add colour by way of creepers, where possible, and trees. I’m not much into flowers – silly, pretty little things. I like my plants to be big and grand and stately. 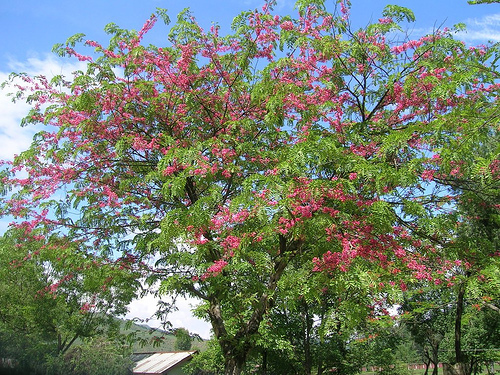 Amit is pleading for a mango tree, but I also need some colour – apart from green. So here’s what I’ve planned. Aren’t they gorgeous? 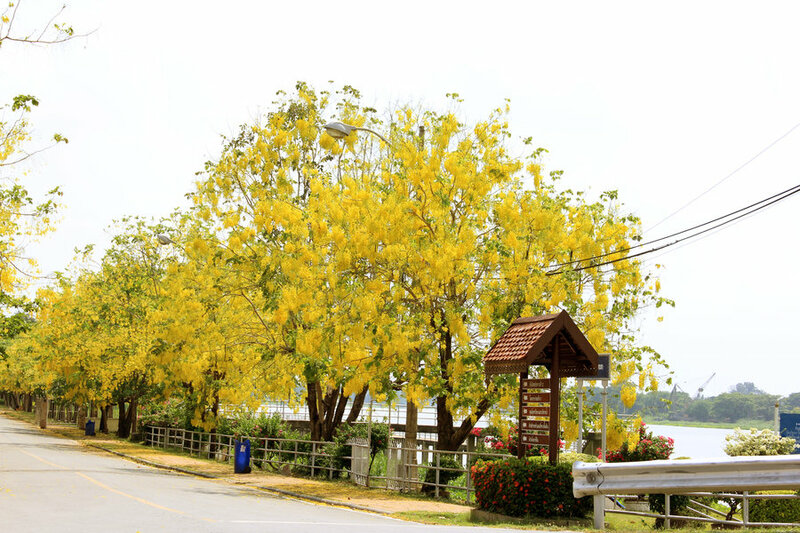 It’s going to be Cassia Fistula (yellow), Delonix Regis (orange/red), and Laburnum Mimosaefolia (purple) in front, and at the back, a gigantic Cassia Javanicus (pretty pink). 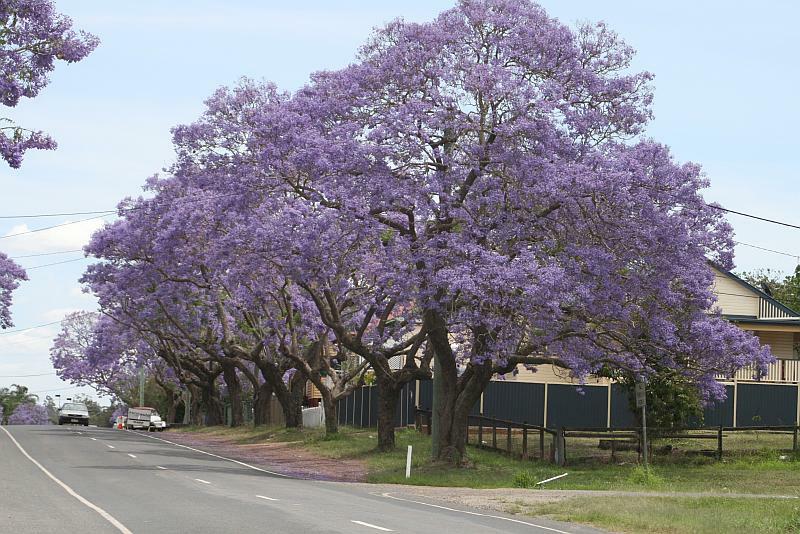 The laburnum, jacaranda, and gulmohar were no-brainers. 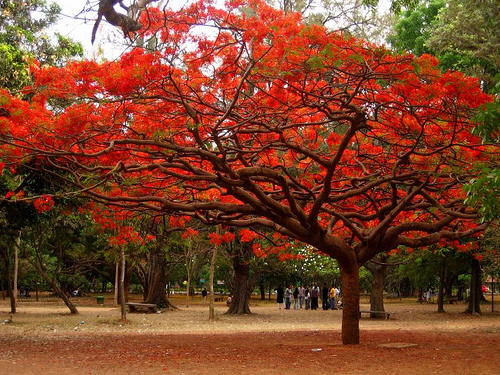 The trees are breathtakingly lovely when they flower and they all flower around the same time. They’re all common in Bangalore, so I know they’ll grow well and I know roughly the size and shape they grow to. And I can just see them crowding up the front, right corner of our little plot – a bright burst of colour on the second-floor level and a lovely mosaic of colour on the ground. The Cassia Javanica is a tree I didn’t know anything about – other than the fact that it grows in Cubbon Park and if you happen to be driving down Cubbon Road at the right time of year and stop at the Minsk Square intersection, it’s quite possible to wish that the light wouldn’t change for a few weeks, just so you can drink in the sight in peace. It’s an absolutely glorious specimen, and the fact that it towers above and delicately frames the statue of King Edward the whatevereth (who I always thought was King George the somethingeth, but was disabused of the notion by this article) doesn’t detract from its charm at all. Now if you consider the footprint of each tree and then consider the canopy of each tree, I’m not sure that our little plot actually has the space to accommodate all four trees. Remember there is supposed to be a house there as well. But by the time Amit is done with his mud brick construction, I will need a splash of colour to make the place worth living. Orange, yellow, purple, pink, that’s all. That’s really not too much to ask, is it? The other day, I got an IT refund cheque. This was a complete surprise. It was for Assessment Year 2008-09. In that year, I had a tax consultant who helped me with my taxes. The fellow was a moron and the following year, when he made my acknowledgement out in the wrong name, I got rid of him. But in FY 2007-08, he did my taxes and he did them wrong. I didn’t even know he’d done them wrong. I still don’t have a good idea about the exact nature of the error(s) he made. But last Saturday, when Amit went to our old home to pick up the mail, he called me to say there was a cheque for me from the IT department, for 36k and change. I’d better hurry up and cash it before the IT gods change their minds, he said. The cheque was already six weeks old. Last year, I had a different tax consultant help me with my taxes. This man riled me up too – because he was stupid, inefficient, and terribly slow. I’ve realized that I’m a person who handles stress very badly. My strategy, therefore, is to avoid stress altogether by getting things done very far in advance of the given deadline. This works well – except when it comes to tax. Because I’m terrified of the whole tax calculation process, I try to use the services of a professional when that time of year rolls around. All these professionals land me in soup, because everyone wants to get things done on 30th July for the 31st July deadline. I want to get my stuff done by 30th June. Nobody understands this. So they don’t lift a finger to help until I beat them up with a stick – metaphorically speaking; though there’s no telling what I would do if I could only get them within hitting distance of a stick – and by then it’s usually 25th July. And I’m getting ulcers. So last year, when I got impatient waiting for this man to send me the final little changes to my tax work, I decided I’d got enough to go on, and I would be able to fill the form, generate the xml, and file it online all by myself. Sigh. I did everything ok, but in one small column somewhere, where the date should have been December 2009, I put in December 2010 – a date still several months in the future at the time. Sadly enough, the tax spreadsheet didn’t even complain about this. In February this year, the IT department sent me a notification by email. I was terribly busy, so I glanced at it and filed it away. In June, I got another notification, which I treated similarly. So it wasn’t until July, a whole year later, when I actually read the third notification, that I realized what they were telling me. They were telling me two things – first that they had tried to deliver my refund and failed; and second, that the refund they were trying to deliver was substantially less than I expected (because of that wrong date, which caused that transaction to fall in the next financial year). I wasted a lot of time, energy, and stress hormones following up with my tax consultant. It was July – he was just starting to work on other people’s current year’s tax returns. He wasn’t interested in some failed refund for some previous year. He didn’t return my calls, didn’t reply to my mails and generally acted as if I didn’t exist. Naturally – he’s not my tax consultant anymore. In the end, I tackled the problem head on. I spent a whole day fiddling around on the Internet and finally I had it sorted. I had filed a rectification return correcting the wrong date; I had updated my PAN card to my new address in the hope that the refund would come to our current address (it had gone back three times, apparently, with the message “no such address”, and I have no idea why that should have been, considering they had no trouble delivering my windfall return from an earlier year to the old address where I no longer reside); and I had, for the nth time, sent my updated address and bank details to the IT gods along with a prayer to them to return my hard-earned cash to me, with interest if you please. Oh, and I had also filed my current year’s tax return – two weeks ahead of the official deadline, even if two weeks behind my own internal deadline. I was exhausted but cautiously optimistic. This might work. And, finally, against all odds, it did. First I got an updated PAN card, and then, almost two months later, I got an updated statement from the IT gods, agreeing with my rectified return, acknowledging that no refund had as yet been paid (hallelujah! ), and dispatching a cheque for the entire amount due – with interest. And today, I got the cheque! Wonders will never cease. *In case you were wondering, I’m the good people referred to in the title. I am. Way back I don’t even know when, Amit bought a Sony twin deck cassette player. If you’re 20-something and you’re reading this, you probably don’t even know what I’m talking about. But this was a Sony cassette player and it served us well for many, many years. Towards the end, when we’d given up listening to tapes, we used it as an amplifier and speaker system to rig up to our WorldSpace receiver. Yeah, that was before WorldSpace went bust, which was devastating for me, because where else can you get to listen to that diversity of music all in one place? Granted that all I ever listened to was UpCountry, but hey, there was tremendous diversity on UpCountry too. Anyway, when we moved out of that house and into this one, we didn’t rig up that system – we didn’t have WorldSpace anymore anyway and tapes had become fossils long ago. We still had a much loved collection of cassettes, but, like our collection of much-loved books, it remained boxed up in our store room for many months. Enter V, our newest cook and all-in-one. She, her husband, and their three-year-old daughter are caretakers of the empty (haunted, so they say) house just behind ours. When we go up to our terrace, we are talking distance from their bedroom window. From our kitchen, we can hear pretty much everything that goes on in their small home. Apart from their occasional tendency to turn the music up too loud, it’s ok. In fact, it’s quite convenient when we need to tell them something. Theirs is a simple life. Some might call it tough. They are employed by a wayward father-son duo. The son always wants to kick them out, the father wants them to stay until they are old and grey. Apparently, their employers don’t appreciate large families, so V and her husband have concealed from them the fact that they have an older daughter – who stays with an uncle and aunt in another part of the city. She is 7, extremely pretty, and calls V – who is her biological mother – auntie. Their younger daughter is small and seems a little under developed for a three-year-old, but she’s healthy and happy. She’s never had a single inoculation or vaccination of any kind because her mother has a thing about injections. Recently, when she had a bad stomach upset, the doctor gave her a de-worming medicine. V threw it away “because she didn’t have worms.” Now she has live worms in her stool. V and her husband can’t ever leave the house at the same time, not even on weekends, because their employer might turn up at any time and he expects them to be around. So they can never go out loafing or to the market together. They buy all their groceries at the nearest (but not necessarily cheapest) corner store. V had to leave a job at another house because her employer said it kept her away from his house for too long. On top of it all, there’s always the danger that their employer might actually succeed in selling the house (at an exorbitant price) and then the new owners might throw them out at a day’s notice. V and her husband are from Darjeeling. They grew up together, fell in love, and ran away together. V’s mother died when she was young and her father remarried. She has no contact with any of her family members anymore. She says she had an election ID card in Darjeeling and maybe a ration card as well, but here she has no documents. No address proof. So they have no bank account. We are their bankers. Their other employer is more of a Shylock, paying them salary arbitrarily, frequently three weeks late, and not always in entirety. They have no recourse. What they do have, is a mobile phone. I don’t know how they got one, without address proof, but it’s all they have. It’s their music system, and their movie hall. They might not be very literate, but they do know how to get movies onto that tiny device and watch them on the postage stamp-size screen. That’s their daughter’s primary source of entertainment (and education). Apart from that, they play music as loudly as they can as often as they can. Thankfully, it’s Hindi oldies, so we don’t mind. Some months ago, I gave them the old twin deck cassette player. It needed some fixing and it took them all these months to get it fixed. V wasn’t keen to leave it at the shop because, she said, they might take out good parts from it to use on other systems. But they got it done at last, at a grand total of Rs 240. I’d given them half a dozen tapes along with the music system – all Hindi oldies. Yesterday evening, I was treated to my namesake song, Anamika, wafting through the kitchen windows with all the robust roundness that a Sony music system can produce even in its old age – and it was quite a treat, after months of suffering the tinny sounds produced by a cheap mobile phone with the volume set to maximum. This morning, V’s husband was lustily belting out an old Hindi Bollywood love song in accompaniment to one of our old tapes. They hadn’t ever played that song on their mobile phone, but he knew all the words anyway. V, who was working in our kitchen at the time, was telling me with subdued enthusiasm that only three of the old tapes I’d given them were currently working. The rest were being dried out on the terrace. They’ll probably work once they dry out, she said, smiling happily. The fact that their employer actually managed to sell the house yesterday and that they don’t yet know what the new owners are going to do with them didn’t seem to dampen her joy much. You are currently browsing the The Twins & I blog archives for September, 2011.